In September a Hydrex diver/technician team removed a bow thruster unit which needed to be overhauled from a 363-meter container vessel. The removal itself was carried out in Rotterdam. Earlier the team had already prepared the thruster tunnel during the ship’s stop in Le Havre, France. This allowed the divers to perform the operation underwater in a very short time frame without interrupting the vessel’s schedule. Because of the ship’s tight schedule in Rotterdam, the time required to remove the thruster unit needed to be brought back to the absolute minimum. For this reason a Hydrex team mobilized to the vessel while it was berthed in Le Havre to perform all possible preliminary work. This included removing the thruster blades one by one and preparing the engine room and the bow thruster tunnel for the operation. When the preliminary work was complete, the team returned to the company’s headquarter in Antwerp. As soon as the container vessel was entering the Rotterdam port, the team mobilized again, using one of the Hydrex workboats loaded with all the needed equipment. The Hydrex catamarans are fully equipped as dive support stations with hydraulic cranes, winches, nautical and communication equipment and a dive control room. They can be used for a wide range of operations in Belgium, the Netherlands, the United Kingdom and France, permitting even more rapid deployment from the Antwerp depot. This increases flexibility of operations, which was essential during an operation like this where only a tight time frame was available. 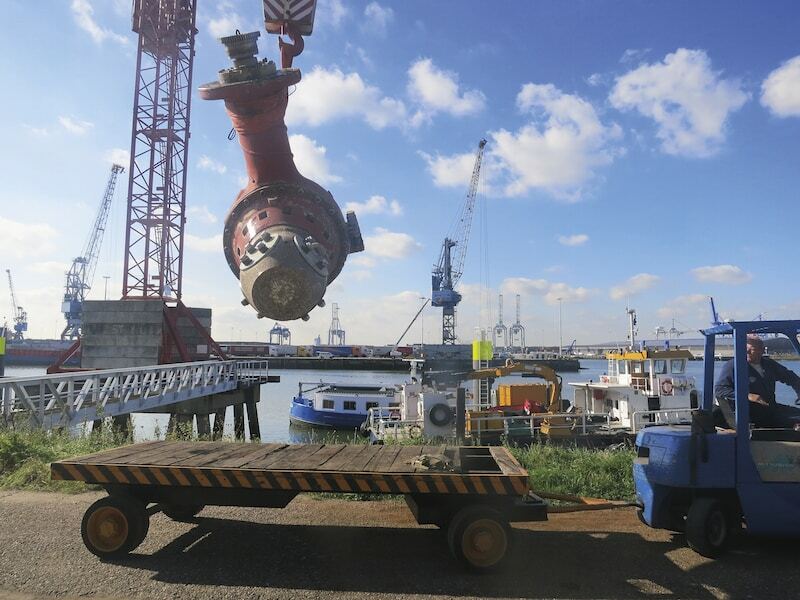 After the diver/technicians arrived in Rotterdam, they secured the gearbox with hoisting equipment. The team then disconnected the bow thruster unit from the engine room and lowered it onto a cradle. This cradle was designed especially for thruster operations. The bow thruster was then brought onboard the Hydrex workboat. Next the team securely sealed off the engine room by positioning a flange over the space connecting the thruster tunnel to the room. This made it possible for the vessel to continue to sail while the unit was onshore being overhauled. With the bow thruster unit on deck the team sailed the Hydrex workboat to the manufacturer. Off-hire time causes a substantial loss of money. It was therefore very important that the ship could keep its schedule. Performing the removal in two stages allowed this. This kind of flexibility can only be achieved successfully by staff who have familiarity with such operations and have the relevant know-how and equipment. Hydrex has a technical department capable of executing all the required planning. Our diver/technicians are trained and qualified to perform the full range of required class-approved repair procedures in even the harshest conditions.